"Saving The Alphabet" is a commentary on governmental and corporate threats to the free use of language, as language is simultaneous constructed and deconstructed by Orwellian double speak, trademark claims, and invented etymologies on the web. The work is created in Flash and uses text, images, and audio. The piece uses ActionScript code to decay language events as they are triggered by users. This decay is gradual and erases elements of the story after they appear. 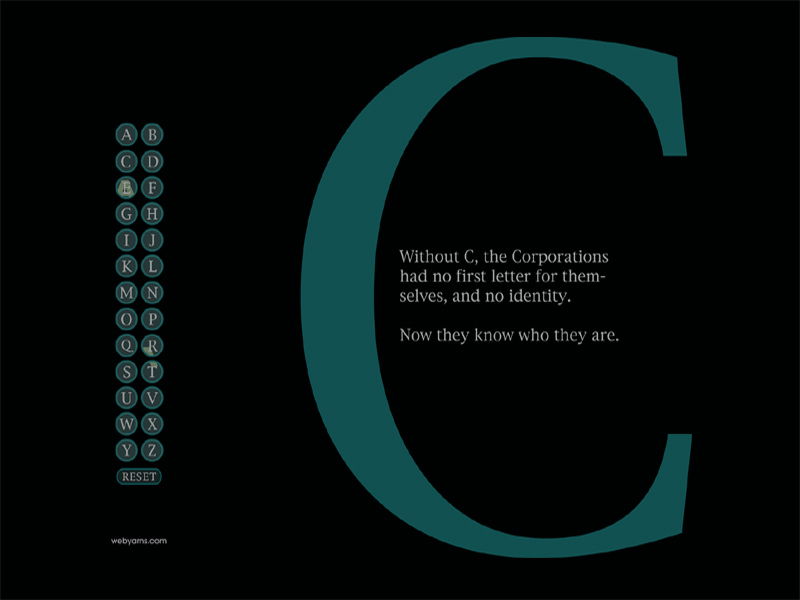 "Saving The Alphabet" is also a statement about the impermanence and permeability of language, and how language, although connected to a historic (and gradually evolving) lexicon, can be altered, corporatized, and destroyed. Additionally, because of the code used on the site, those who navigate the piece themselves become a contributing factor in the decay of the story, and their contribution to the fictional death of language suggests our wider social and aesthetic responsibility. Alan Bigelow's work, installations, and conversations concerning digital fiction and poetry have appeared in Turbulence.org, Rhizome.org, SFMOMA (Open Space), Los Angeles Center for Digital Arts, 14th Japan Media Arts Festival (The National Art Center, Tokyo), FAD, VAD, FreeWaves.org, The Museum of New Art (MONA, Detroit), Art Tech Media 2010, FILE 2007-2011, Blackbird, Drunken Boat, IDEAS, New River Journal, Hallwalls Contemporary Arts Center, and elsewhere. You can see Alan Bigelow's work at http://www.webyarns.com.